South of the border, down Mexico way, is a beautiful getaway spot that appears to be part of Baja California, but really is in Mexico. On the very southern tip of a California map is Cabo San Lucas. Part of it faces the Pacific Ocean, and part of it faces the Sea of Cortes. The most scenic part is the Sea of Cortes side. This is where we spent a week, sunning, relaxing, sampling wonderful foods, and WHALE WATCHING. Yes, real leviathans, not the customers in the candy aisles of Walmart. Indeed. 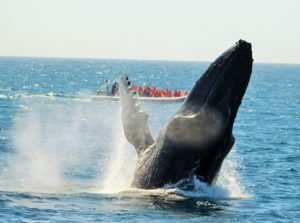 We actually got to see a few of the mother whales and their offspring breaching up close to us during our boat outing. To say dramatic would be a gross understatement, rather akin to saying that the Grand Canyon is a sizable ditch. The fish, and seafood dishes at our hotel were served fresh, and prepared wonderfully, as were the Tequila drinks, both mixed and straight. It’s fun to see how the imbibition of the nectar of the agave plant can act as a powerful intelligence suppressant. As a side note, there is Tequila to be had, as well as a local beverage called “Agave Liquor,” which is far less potent, and far more flavorful than Tequila. However, nobody has written a song called “Agave Liquor” yet. That might explain why Tequila is far more popular, and more consumed than Agave Liquor, along with the fact that Agave Liquor is not exported. The Medino beach, located at our hotel, was a bit too chilly for snorkeling, so we confined ourselves to a couple of the hotel swimming pools for our watersports. 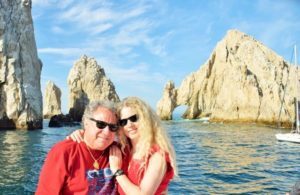 All in all, for a short vacation, with a bit of adventure, Cabo San Lucas is just right, whether you consider it part of California, or Mexico. Viva el sol.